Choosing the right domain name for your website is imperative to the site’s success. There are many things to consider when deciding on a domain name. The domain name is the very first thing your customers see, even before the site loads. We will discuss everything involved in selecting the right domain name, the right top level domain name, and how our services will help. Before we cut into the meat, let’s briefly discuss terminology to ensure we are all the same page. Domain Name - The domain name is what you type into the browser after www. e.g www.yoursite.com Top Level Domain - The Top Level Domain (TLD) is the part the comes after the domain name. You’re probably most familiar with the .com TLD, but there are many more to choose from. We will go over a few of the others a little later and what they mean, each TLD has a distinctive purpose. Domain Name Registrar - A registrar is the place where you register your domain name. Just like you register your car, you need to register your website. Like your car and the License number your website needs a domain name to make it unique.. The very first thing you need to do when trying to decide on a domain name is to brainstorm. Even though it may seem mundane, the domain name is the most publicly recognizable thing about your company or website. The domain name needs to be unique, it needs to immediately communicate what you offer to your visitors. The first thing to do is to brainstorm some key words and phrases that describe what you do. Generate about 8 words you feel connect most closely to your business. Once you have done this then you can start to meddle and pair up the words, adding prefixes and suffixes to further expand the list of words you could possibly use. If you are having trouble with this there are online name generators where you can enter a few words and it will spit out several combinations. There are many generators out there but here are a couple links to help you get started. This site will combine your keywords and also display available domain names. A very straight forward process that breaks up the different Top Level Domain (TLD) names into categories to help you decide whether you need a .org, .com, or .rocks. We’ll discuss how to choose the right TLD a little later on. domain name should be apparent; this is very important for new companies or websites. When someone sees your domain name for the first time it should be easy for them to decipher exactly what your company has to offer. Domain names like freecreditreport.com and shoebuy.com are great examples, you know exactly what they do, even before you visit the site. Obscure domain names need a lot of branding and advertising to associate the name with the company. Sites like Amazon.com and Google.com can get away with this because they have spent thousands making their names synonomous with shopping and online searches. As a new company it is recommended that you choose something more obvious. Top Level Domain. You know it, you’ve seen it, you may have even typed it, but what is it? 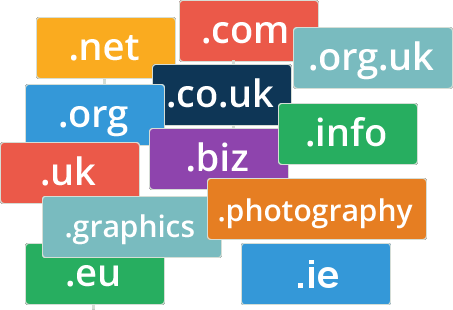 Simply, Top Level Domain names are the last two to four letters after the dot. Most commonly you’ll see dot com or dot org. But each TLD has a different meaning and can greatly affect your branding and search engine optimization (SEO). We will cover a few of the most popular TLD now, but remember there are many more you may want to choose. Don’t forget you can register more than one that will lead to the same place, your website. .com - This is the most widely used and recognizable TLD, and probably the one you will want to go with as most people will assume that .com will come after your website’s name. This TLD is typically associated with businesses that run for profit. .org - is very popular among the non-profit organizations. If you want your visitors to instantly recognize your website as a non-profit this is a very good TLD to use. For example, craigslist.org is a huge classified website that uses the .org TLD, however if you type in craigslist.com your browser will take you to craigslist.org, because they also registered the .com to ensure that the people who accidently typed in the wrong TLD will be redirected to the correct site. This is a great example of why registering more than one TLD is a good idea. .net - is a common TLD in the technology world. Online businesses often use this TLD to show that they are on the cutting edge of the tech-world. .info - .info stands for information. This TLD is widely recognized and used in countries around the world. Sites that are purely informational or educational often choose to use the .info TLD, but it can be used by any business. .me - Is used for personal space, such as a personal blog or an online portfolio. It is a little more obscure than the other TLDs but instantly recognizable as a personal site. The fun thing about these is you can use them as part of your name. Say your company or website name is “ILove”; if you chose the .rocks TLD, your full domain name would be “www.ILove.rocks”. Presumably, your site would be about how much you love rocks and geology. Again, however, I want to stress how important it would be to register the more commonly used TLDs as well. If someone hears about your awesome website from a friend they might go home and type in “www.ILove.com” and end up on someone else’s website or to a page that displays nothing at all. If you go with a TLD other than .com I would recommend only choosing a domain name that is also available in .com and then register both of them. This is especially important if your target audience tends to be not so tech savvy, as these people will tend to type in .com without even considering the alternatives. So you found the right domain name, decided on the right Top Level Domain for your company’s website, searched the registrars, and no one is using the name you want. You followed all the advice above and picked a short descriptive name that is going to bring in lots of visitors to your website. Thats great, but before you go through and register the name there is one more thing you need to check. Just because the the domain is free doesn't mean that the name isn't copyrighted by someone else. Copyright infringement could destroy your website and force you to change your domain name while you are still trying to build an audience, causing you to lose the visitors you’ve already established. Go to http://www.copyright.gov/ and search their database of copyrighted names to ensure you are in the clear. We will register the domain name for you and help you decide which top level domain is right for you. It is important to have an official domain name that is securely registered, your customers will feel more secure ordering online and submitting sensitive information. All of our domain services include an unlimited Email address (e.g. You@yoursite.com) to communicate with your customers. Simply using a gmail Email account to communicate with your customers won’t suffice in today’s world of identity theft, your customers need to be assured they are dealing with a legitimate company. We will renew your domain name every year to ensure you never lose your name. Contact us today and let us take care of everything, you’ll have a legitimate domain name for your business without any of the complicated work, we make it easy to get your business online. .IE is the official domain name for the Republic of Ireland. 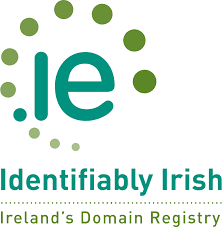 We will register a .IE name for you with the IEDR in. Dublin. It is a little bit more difficult then registering a .com but as an IEDR agent we are in a position to register it in a fast and simple manner. .ie - Is a country code top level domain. This TLD will instantly demonstrate your website as an Ireland based website. Only companies based in Ireland can use this TLD, your visitors will instantly recognize your site as a local company.